Occupy Wall Street: Was the NYPD Authorized to Pepper Spray Peaceful Observers? An inquiry into excessive pepper spray use at the Occupy Wall Street protest reveals much — including the NYPD’s failure to abide by its own guidelines. On Saturday, the New York Police Department arrested approximately 80 people — many participating as part of Occupy Wall Street, a peaceful protest against Wall Street and the economy. Two police officers clad in white shirts approach the women. One of them is equipped with pepper spray. He has been busy off-screen. He points fiercely at the three penned women, barking, “You guys are all going to be going” — presumably in response to the legitimate question “What are you doing?” The young woman on the right, still stunned, stretches out her hand. And he responds by spraying her in the face with pepper spray. He moves his arm to the right and sprays the others. As the three women scream in pain and flail their arms, the netted orange perimeter is broadened. But not a single police officer steps inside to aid the women, much less arrest them. Other people scream for someone to bring water to the three women. The NYPD would not confirm with The Gothamist whether or not it used pepper spray in any of the arrests. Yet the videos clearly indicate that it did. According to CBS News, the NYPD called every arrest justified. But an equally important question is this: Why did these officers consider the use of OC justifiable against these peaceful observers? These three videos contain enough information about the macing incident to reconstruct a substantial portion of it. Reluctant Habits has also obtained a 2005 edition of the New York Police Department Patrol Guide, which outlines the specific use of pepper spray in Section 212-95. By the 2005 standards and based on the available evidence, it is clear that the NYPD did not follow appropriate measures. We see in the above videos that the women were not assaulting the police officers (unless stretching out one’s hand to get one’s bearings is considered “assault”). There was no need to establish physical control. They were not fleeing from arrest. (Indeed, how could they when they were trapped in orange police netting?) They were not emotionally disturbed persons. They were not dangerous animals who were going to injure anybody. In looking at the Patrol Guide, we learn that the police are obligated to arrest the person who is pepper sprayed and charge them with a crime. Yet we see that the police do not make any moves towards the three women. They are left to scream, kneeled in the streets and in pain. They are not criminals. But they are clearly examples of what befalls “bad” citizens. Given the distance of the officers from the victims, it’s likely that none of the officers asked the women if they were wearing contact lenses. Nor were the women placed in a sitting position to promote free breathing. They were left to fall to the ground and suffer. The Patrol Guide also specifies that officers should provide a source of water and flush the contaminated skin of those who are pepper-spayed. Even if we give the NYPD the benefit of the doubt, and accept that the situation was an anarchic one and that it was hard to enforce these guidelines, one would think that this flushing proviso would be followed to the letter — if not as an enforced code, then at least as a basic quality of humanism that requires no explanation. But for a good twenty seconds, the women are left to scream and to experience pain, with one woman stretching her arms in an effort to find some relief for her anguish. 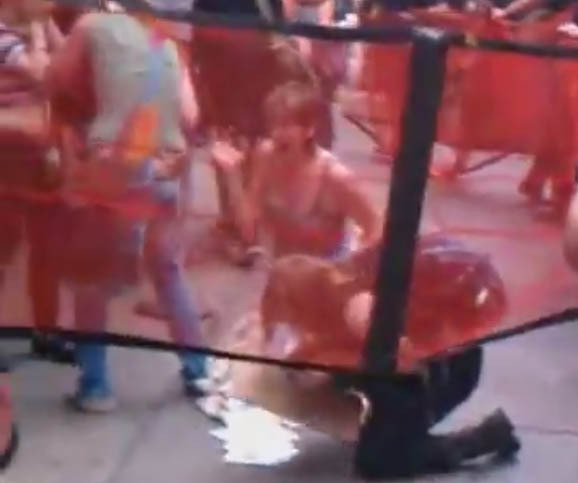 The women who are not sprayed appear to want to help her, but, trapped inside the orange netting, they cannot offer water. The NYPD’s conduct does not fall into the five general categories of pepper spray use. It fails to adhere to the NYPD’s own guidelines. And since the NYPD cannot own up to its inhumane behavior, despite repeat inquiries, it suggests very highly that the police are not especially committed to Fidelis ad Mortem — especially that vital faith in innocent bystanders whose only crime was to ask what was happening to fellow human beings. crime which initiated use of the pepper spray. areas such as automobiles and closets. a. Advise person sprayed that EMS is responding. recommended that contact lenses be removed as soon as possible after exposure to O.C. a. The subject should never be maintained or transported in a face down position. b. Do not sit, stand, or kneel on subject’s chest or back. with profuse amounts of water. stationhouse, if this has not already been done. c. Advise hospital staff that pepper spray has been used on prisoner. OF PRISONER (PD 244-150) in arrest situations. 9. Complete the AIDED REPORT WORKSHEET (PD 304-152b) in non-arrest situations, e.g. was discharged to the commanding officer, Firearms and Tactics Section. 11. Analyze situations where O.C. spray was employed to evaluate its effectiveness. through the Firearms and Tactics Section. patrol duty should be sufficient to keep the solution thoroughly mixed. other appropriate force options and tactics. UPDATE 2: The NYPD officer who pepper sprayed the protesters has been identified as Anthony Bologna. A Downtown Express profile of Bologna reveals that he became a police officer late in life and there is this telling quote: “You read in the papers about cops doing things that you can’t believe because you think everybody’s like you. But a department this large can’t really be completely free of it. If you don’t find anything wrong, you’re in real trouble because you’re not looking.” I am also investigating this article from 2001, which suggests the possibility that Anthony Bolgona attacked another protester at a Mayday NYC protest in 2001. UPDATE 4: The Guardian reports that Anthony Bologna may have committed civil rights abuses during the 2004 demonstrations at the Republican National Convention. Excellent coverage yourself, Ed. You keep the protesters safe or safer with your scrutiny. somebody needs to be checking the certification records of these officers. A friend tweeted me your link – I have done my own short analysis using all 4 discovered separate videos/feeds here: Video Analysis- Pepper Sprayed at OccupyWallStreet and linked your post on that page. I have just ordered the most recent Patrol Guide. Should have it sometime tomorrow and will update the information and draft some language for formal complaints. The name of one of the other women was also given in a DailyKos diary. I’ll try and find it again. Also one of the women was apparently deaf – as reported by a photographer on the scene who assisted them afterwards. I believe that in addition to complaints to NYC and NYPD – an ADA/Civil Rights complaint be filed. I also think action can be immediate (rather than wait for an inquiry) if we organize to focus on protect-ING all others in possible use of force in days to come. A formal call for ENFORCEMENT of the law/policy should be made. Maybe that will get proper news coverage. This story has the potential of a PR coup for the protest/protesters and nightmare for the NYC/NYPD officials. Its also clearly not an us vs. them (protesters vs. the police or protests vs. the law) – since the officers (in blue) were not only shocked and surprised (and uninvolved) but were also victimized by the two “white shirts” (superior officers). I may also try and obtain the recent Administrative Guide of the NYPD.